If you have played a game that communicates your responses in the game to scientists in the form of research data, then you are a citizen scientist. Citizen science refers to the practice of participating and collaborating in scientific research to increase scientific knowledge. To participate in citizen science, you may not necessarily be a paid volunteer or be a professional at the subject being researched. All you need to do is contribute to data monitoring programs through your skills and mind. Games have become an excellent medium to collect such information. Medical research has benefited a great deal through games because games cater to a large global audience consisting of different ethnicities and cultures. Let me take you through some of the games used for medical research which I have played and have found quite interesting. Sea Quest Hero is a mobile game specifically designed to study “spatial navigation”; one of the inital symptoms while identifying dementia. Dementia make it difficult for people to navigate in familiar places and environments. 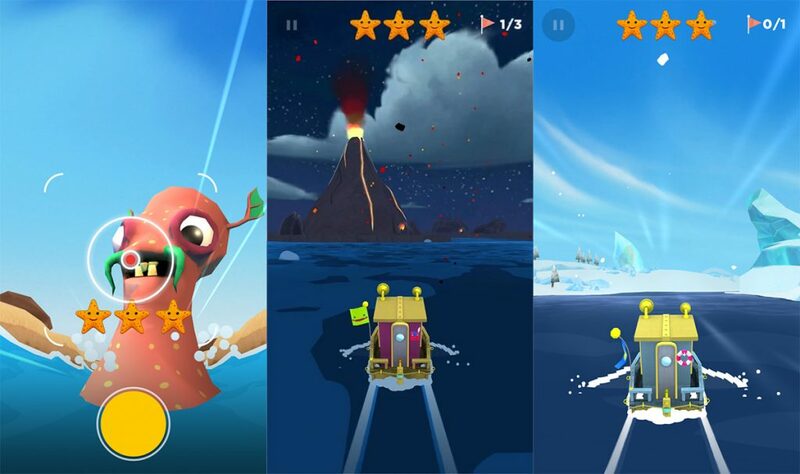 In the game, players are expected to make their way through mazes of islands and icebergs, every second of which gets translated to scientific data. Two minutes spent playing Sea Hero Quest is equivalent to five hours of lab-based research. The player is tested through 3 tasks – the first requires the player to remember 2D maps and navigate through 3D mazes, the second requires the player to collect flares in the maze and shoot at the buoy at the starting point, testing the players’ orientation, and the last task is to chase creatures and capture pictures of them. The data collected from the game enables scientsists to study how thousands of people from different countries and cultures navigate through space. This also sheds light on how the players use their brain to navigate, thus aiding the future work on diagnostics and drug treatment programs in dementia research. In EteRNA, the player assumes the role of an RNA Scientist to help invent new RNA molecules to combat infectious diseases like Tuberculosis. What is an RNA you might want to know? RNA or Ribonucleic Acid is one of the three major biological macro-molecules that are essential to all known forms of life (the other being DNA and proteins). Each RNA molecule is made up of 4 bases – adenine, guanine, uracil and cytosine. In the game, the player has to connect these four bases and design complex new RNA molecules. While doing this, the player also unknowingly gives feedback on the biological function of the existing designs presented at the start of each level. Re-designing molecules, also known as folding molecules is key to combating infectious diseases, and the game does just that. The game makes use of pattern matching skills of players. The game has no winning or losing criteria. The player either creates a design and moves to the next puzzle, or keep working on the existing design puzzle until a pattern is formed. There is a leader-board which shows the player where they stand among other players in RNA design creation. Developed by scientists at Stanford and Carnegie Mellon universities, it is these folks who use the designs created by the players to decipher how real RNA works. Phylo is a game aimed at comparing genomes of various species that have existed down the centuries. Comparing genomes is known to help break down human DNA and identify new genes. A genome is any organism’s complete set of DNA, including all of its genes. Sequence Alignment is a way of arranging the sequences of DNA, RNA or protein to identify regions of similarity. This game has been designed around the pattern recognizing and problem solving skills of humans. Sequences are presented to the player in the form of different colored blocks. The player has to attempt to create the highest score for each set of sequences by aligning or matching as many colors as possible and minimizing gaps between them. All alignments in the game are said to contain sections of actual human DNA which have been speculated to be linked to various genetic disorders such as breast cancer. This alignment when rearranged by the player is received, analyzed, and stored in a database. Phylo is supported by McGill University, Canada Foundation for Innovation, Genome Canada, CIHR. Foldit has been around for a long time. Infact EteRNA is a descendant of the Foldit game. 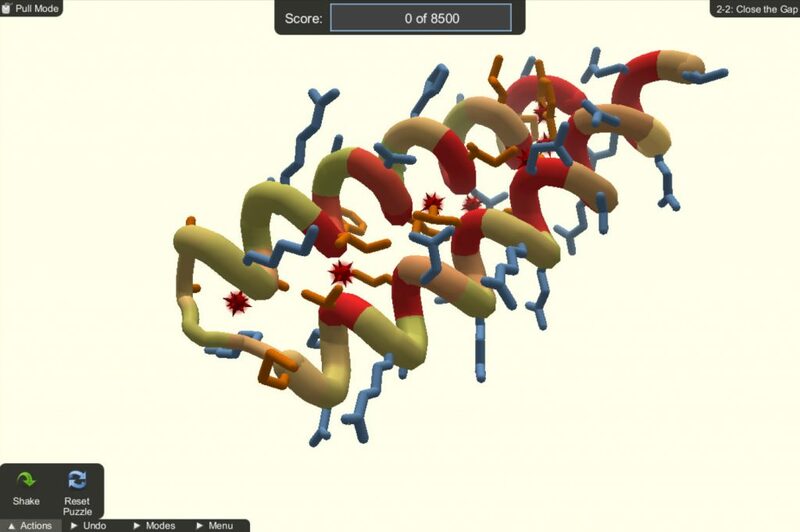 But while EteRNA revolves around designing RNA molecules, Foldit revolves around folding proteins. Proteins exist in every cell of all living things. This includes cells in the muscle, brain, blood, and every organ. Inside those cells, proteins perform their own individual function to keep the human body running. Proteins fold up into a very specific shapes. This shape specifies the function of the protein. For example, a protein that breaks down glucose for the cell to convert it to energy, will have a shape that recognizes only glucose. Likewise for proteins that send nutrients to your blood or signals to your brain. For a scientist, knowing the structure of a protein is key to understanding how it functions independently or when targeted with medicine. The game therefore uses the player’s pattern-recognition and puzzle-solving abilities to design or fold proteins in new ways. Stall Catcher is a game designed to help researchers with their study on the Alzheimer’s disease. The goal of the game is to observe the sequence of images and decide whether the blood is flowing through the vessels or is stalled. Alzheimer’s is known to occur when there is reduced blood flow in the brain. This is detected during imaging of the brain where blood vessels appear clogged by white blood cells that stick to the walls, blocking blood flow and causing a stall. 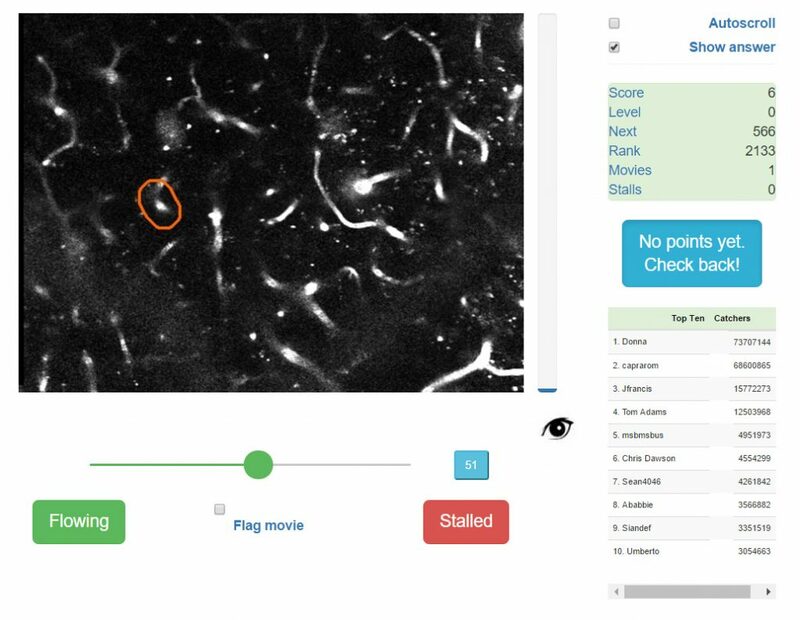 The game is designed to help researchers at Cornell University to search the brain for stalled blood vessels. Although the researchers are experienced enough to identify stalls, the team working on research may not be that large to analyze magnitudes of data they receive by themselves. The game therefore aims to speed up this research.